In this age of increased global interdependence, more and more people are marrying foreign nationals and bringing them to the United States, or simply living in the U.S. with their foreign spouse. However, many remain unaware of the fact that a foreign spouse’s presence in the U.S. is often totally dependent on their marriage, unless they are able to obtain lawful permanent resident (LPR, or ‘green card’ holder) status, or citizenship. If you divorce your foreign spouse, it may place them in a potentially dangerous situation where their immigration status is uncertain. A divorce may cause difficulty with at least two categories of immigrant status. The first is when a person’s status is tied to that of their spouse. The most common of these is where both spouses are present in the country on non-immigrant visas. A skilled worker with an H1B visa, for example, can usually bring their spouse and minor children on what is called a derivative visa (in this case, usually an H4 visa). However, since the spouse’s presence in country is based entirely on their spouse’s H1B, a divorce effectively erases their right to be present in the country and removes their status. The other common type is if you are married to a nonimmigrant. 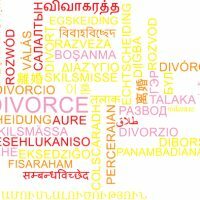 When seeking a divorce in those cases, it is generally a good idea to seek another nonimmigrant status (if possible for you) before going forward with the divorce. If you fail to do this, you may be required to leave the U.S. once your divorce is final. Failure to leave voluntarily can open you up to being deported or found inadmissible (depending on your situation) – either status may make it impossible for you to return to the country for a period of years. Normally, if a foreign spouse has received their green card, they are a lawful permanent resident of the U.S. and that status can only be terminated if they are found to have committed fraud in obtaining it, or have committed a certain crimes. There is an exception: the green card a foreign spouse receives when married less than two years at the time of issuance is considered conditional. After the two-year period has expired, the foreign spouse can apply to have the conditions removed. If the marriage ends before the two years are up, the burden is on the foreign spouse to show that the parties entered into marriage in good faith and to give reasons why the foreign spouse should still be permitted to request the conditions be removed.